We will be regularly updating the photos of the learning activities we have got up to, so please come back again soon. If you would like any further information about the learning we have covered, or the forth-coming learning topics, please don’t hesitate to come and see us. We will also post topic overviews for the term and homework tasks on the classroom noticeboards. This term we are following two IPC themes. Our term begins with 'Brainwaves' which is all about how our brains work and help us to learn. Our next theme is 'From A to B'. It begins with a Geography focus. We will be making maps and plans and thinking about our own locality. We will also be finding out about different types of transport. Professor Sparks visited Year 1 and 2. We had to dissect a brain (not a real one) to find out what our brain helps us to do. We got our brains busy solving puzzles. We learned that knowledge and skills work together to make understanding clear. Just like looking through 3 d glasses. When we looked through just blue (knowledge) -nothing happened. When we tried just red (skills)- nothing happened. When we tried blue and red together (knowledge and skills) the magic really happened it all became clear and we understood. This is like learning. Professor Sparks set us a challenge. We had to work out the way to carry out an obstacle course by asking questions. We then had to practise the skills to get better and quicker at it. We had a fantastic trip to the ‘Steam Railway Museum’, learning all about the history of the Railway and important historical people such as George and Robert Stephenson and Isambard Kingdom Brunel. This term we are continuing our theme ‘From A to B’. We have been using the iPads and QR codes to research and find out about transport in the past. In Science we carried out a simple investigation to test paper aeroplane flights. We had to think about how to make our test fair. We suggested ways of improving our aeroplanes. We made our improvements and tested again to see if they worked. 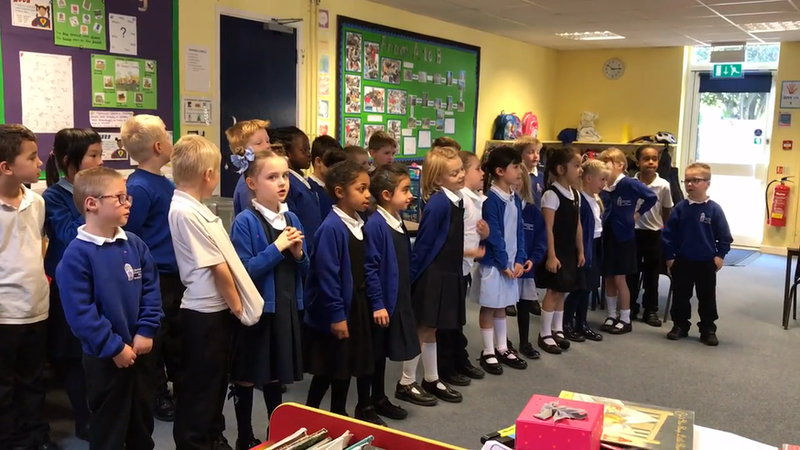 We have performed our KS1 nativity performance, ‘The INN-spectors’. The shepherds and sheep visited. We have been investigating forces. We looked at the car going down the ramp. We tested different surfaces to see find out what happened. We learned about and tested for wind resistance. The goddess Athene visited us. She told us her story about how she was born. She told us a story about a competition she had with Poseidon and how the first olive tree was created and the city of Athens was named. We tried some olives and feta cheese. We created shield designs as Athene is the goddess of war and wisdom. We looked at Greek pot designs to find out more about how the Ancient Greeks lived. We made our own Pot designs. We had a super day dressing up as our favourite book characters. We learnt about the Native American Indians and the story behind dream catchers. We have been making a simple dream catcher. We dressed up as characters from different stories and times. Our grown ups came in to find out about our term’s learning.